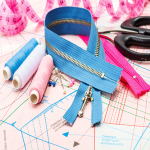 The thought of making your own patterns can be daunting. After all, it looks complicated at times. I remember wanting to learn patternmaking so bad, before so much information was available on the Internet. Actually, before the Internet existed. (How did we ever live without it?) I knew one person who knew how to make patterns and I was willing to pay for lessons, but getting her to share her knowledge was like pulling teeth. So I decided to go to school because I knew learning to make my own patterns would give me the freedom to make any type of garment I could dream of. And guess what I found out? No matter how complicated something looks, if you have the desire to learn it, you can. You just need to start at the beginning. That’s it. Don’t start from the middle or from the most complicated area. Learn the foundation first, then build from there. 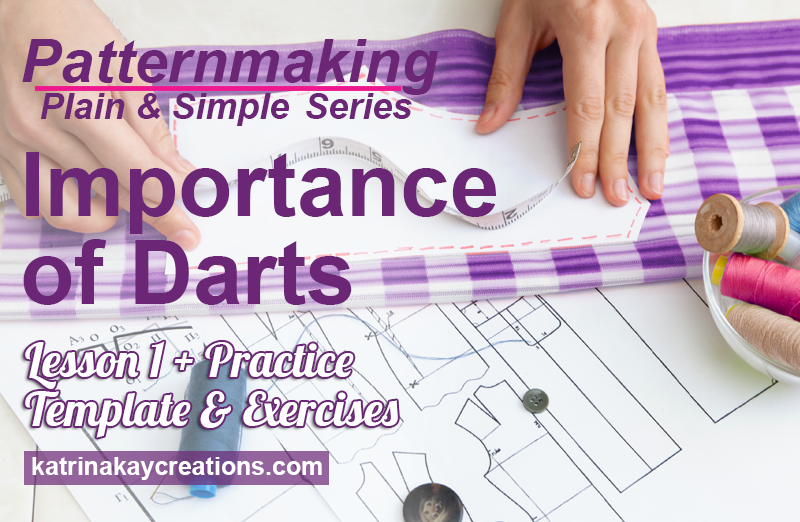 That’s exactly what I want to do today in this first lesson (there will be a total of 3 lessons) of patternmaking, where I’ll be talking about and showing you the importance of darts. Keep in mind, I will not be talking about fitting your curves in these patternmaking lessons. That comes after we understand the basics. Why? Because fitting can make everything complicated. Fitting can cause you to get stuck in one place, and if you’re anything like me, you won’t move forward until you figure it out. No, my friend, I’m going to teach you the same way I learned when I attended the Art Institute. They laid the foundation by teaching me the basics and each new patternmaking class added to that foundation. We use darts to fit fabric to our bodies. Think about it, without darts, our clothes would be like cylinders of fabric around our bodies just laying there. Or we would still be dressing like those in ancient Rome, in a toga. While there’s nothing wrong with draped clothing, sometimes you just want something that fits with a little less fabric. That’s where darts come in. Those triangular shaped do-dads that are oh so very important in patternmaking. 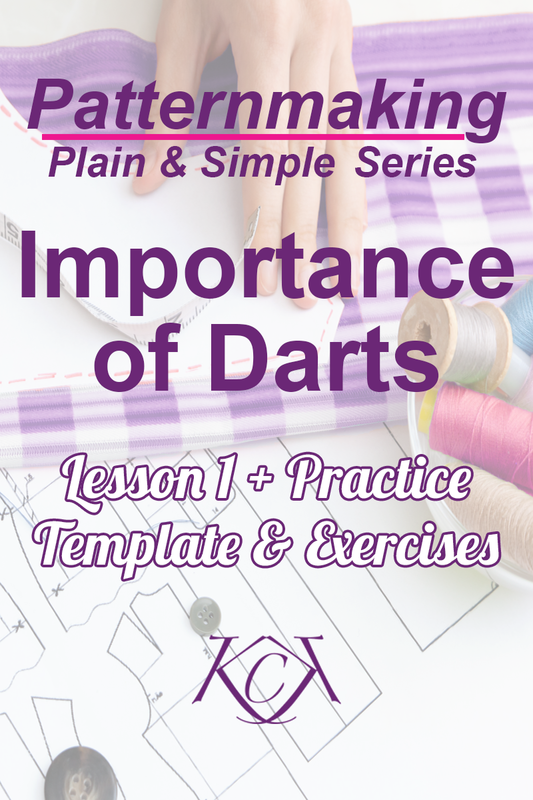 When you understand the role of darts, you will have laid a strong foundation in patternmaking. You will have started at the beginning and you’ll be ready to build from there. Every garment ever made is made from a pattern. Every pattern is made from a sloper, which is a basic pattern made using a set of custom measurements. Those measurements can come from a person’s body or a dress form. 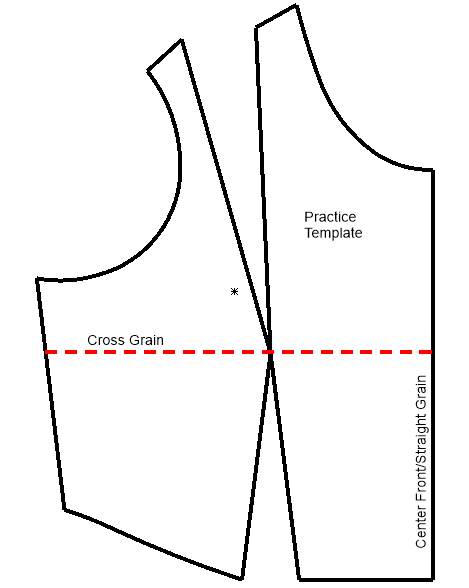 The sloper is your “template”, so to speak, that you use to create various pattern styles and the designs you want. In most cases, the sloper has at least one dart. The example I’m using in this lesson has 2 darts, a shoulder dart and a waist dart. 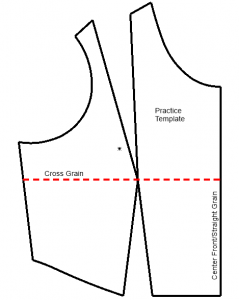 Use this half scale Practice Template (sloper) to practice your patternmaking. The darts in a sloper can be manipulated. In other words, darts can be moved or changed to create a new style or design. Darts can remain as darts, or used to create pleats, tucks, gathers and even seams. Darts are a major part of changing a pattern from a basic sloper to a totally different design or style. With the Slash/Spread Method, you slash or cut the pattern and spread or move a small section of the pattern to close one dart and create a new one. With the Pivot Method, there is no cutting of the actual pattern involved. Instead, you trace the pattern and close one dart to create a new one by pivoting the pattern clockwise or counter clockwise. In the video below, I’m going to show you both methods. You may favor one over the other, but it’s good to know how to use both methods. After you watch the video, I want you to practice what you’ve learned. In patternmaking, the best way to learn is by doing. I created a Worksheet so you can practice the slash/spread & pivot methods yourself on 3 homework exercises and a Practice Template to use as your sloper. Once you’re done with the exercises, you can check your patterns with my video answers in tutorial format. With the Practice Template, you can print as many as you need to practice on. It is half scale so it’ll fit on 1 sheet of paper, and it does not have any seam allowances. When figuring out how to change your practice template to look like the exercises, ask yourself this question: “Where are the darts?” From there you can determine which dart was moved (manipulated) and where it was moved to. Don’t forget, it’s all about the darts! Once you’ve done the exercises using the slash/spread method & the pivot method, go to the video answer key to check your patterns. 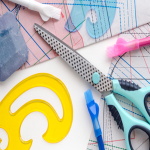 When it comes to patternmaking, are you at the beginner, intermediate or advanced level? Let me know in the comments. Hi Ircelijn, I hope the videos have been a help to you. Let me know if you have any questions. I am grateful for the opportunity to learn pattern making techniques. Finally, I get to learn how to correctly adjust sewing patterns and make clothing that will actually fit my body. Looking forward to diminishing my enormous fabric stash with wonderful outfits. Excited beyond words!!! 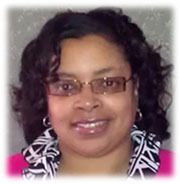 Welcome, Arlene! You and I have the same idea. I want to diminish my fabric stash also. I’ll be creating more videos after in the new year. I am a beginner to Patternmaking and also a full time caregiver. I may require extra time to practice but I am committed to learning and perfecting all techniques. Take as much time as you need, Arlene. The lessons will be there for you when you have the time. Hi. I feel great to be here. I’ve been sewing for years but i’m a beginner in pattern making. I must say I’ve always found patternmaking complicated but as you said, “no matter how complicated something looks, if you have the desire to learn it, you can*. I have a burning desire to learn it now and I wish to start from the very beginning! You’re welcome, Ronke. Glad to have you here. I found patternmaking complicated also when I first started to learn. I know you can learn it just as I did, and starting from the beginning will give you a sure foundation to build on. Let me know if you have any questions. Hi Katrina. I”m a beginner just starting out. Mum always said I had a strange shape. I have had to wear oversize tops and long pants have never fitted well no matter how many cuts I have tried. So I am going to make clothes that fit me. I know I am in for a lot of learning, but I”m making progress and it wont be too long until I have some really nice comfortable clothes to wear. I have started the journey with a long sleeve jersey top. I found a free pattern, but my hips are big my chest small and I have a short torso and small shoulders nothing like a classic male figure. I have gone as far as to make a Muslin to help workout a fit for me, and from there I have been working out a pattern, but when I showed it to a lady that knows something about sewing she said I had missed a few measurements and I would need to add bust darts. So I am here to learn how to work with darts, and I have to say your lesson one tutorial is really well done, even a newbie like me is understanding it. Still How big darts should be and where they located I am not sure about that yet. Hi David, let me start by saying I’m totally unfamiliar with making patterns for the male figure. But in answer to your question about how big darts should be, that depends on where you’re using them for fit and how much room you need. I don’t see a lot of male garments with darts, unless they’ve been changed to gathers, pleats or seams. So it really depends on the type and design you’re making. Just watched the first video and I am excited. I am new to pattern making. While I can sew reasonably well I cannot vary from the pattern. Too scared too and I don’t know how. I have a large stomach and abdomen now and I’m buying large size patterns which fit my girth but end up too big everywhere else. I live in New Zealand so thank goodness for you and the internet. I am looking forward to your tutorials. Hi Katrina. (I’m so excited we have the same name!) I hope the tutorials will be the start of your patternmaking journey. If you have any questions, feel free to ask. Thank you for your support. Hi Katrina, I am a beginner in pattern making and sewing. I am a plus size and find it difficult to find clothes that fit well. I love wearing T Shirt but find that the sleeves hang down to my elbows so that the width fits my hips. I would love to learn how to sew my own clothes professionally. I prefer a tailored T Shirt to the sloppy kind. I hate showing my legs so i always wear maxis. I also like light jackets over my skirts or shirts with a cami under. If you can help me draft a pattern, I would be ever so grateful. Andriana, read my blog post here: http://bit.ly/2gQq9A0. There’s a link to a free resource by Threads Magazine that shows you how to draft your own pattern. I’ll be sharing some drafting tutorials, but it looks like it won’t be until sometime next year. I hope Threads Magazine’s free resource can help you in the meantime. Katrina , you are blessed for this. You are a natural. I have had a lot of headaches trying to figure out pattern making. I am a beginner and now I see darts with new eye. I have practised and feeling excited. Thanks a lot. You’re so welcome, Ajibola. I’m excited for you. I was excited when I finally learned patternmaking also. It was so hard to find someone who would teach me so I had to go to school to learn. In fact, I just paid off student loan debt from that school. I’m glad to help others learn. Let me know if you have any questions and keep practicing! I am a beginner to pattern drafting, have some experience with sewing using commercial patterns. Your clear step by step instructions are most helpful. Oh good, Cheryl, I’m glad my tutorial helped you. Thanks for checking it out and for commenting. Thanks for taking the time to teach me about darts, I do a bit sewing making my own clothes, but my daughter I used to sew for her went she was much younger, now she is 28 years old and she wants me to sew a jacket for her for work, but I am a bit nervous, because I have not sew for her a long time. So I would like to know how do I measure her, because the bust is extra large, and I am afraid that I may not take the right measurement of her, so could you please help me gain that confidence. Thank you. Hi Nyta, this article from Threads Magazine may help you. You can find it here: http://bit.ly/1jDv7zo. It takes you through the measuring process. For a jacket, you won’t need all of those measurements, but you can just choose the ones you need. Also, make a the jacket out of some old or inexpensive fabric first to test the fit on your daughter. That way you won’t mess up your good fabric if the jacket needs to be altered. I hope this helps and thank you for commenting. Miss Katrina, I love the fact that you explain the making of a sloper BEFORE all that stuff that makes me crazy about pattern making. I’ve been looking at patterns on Pinterest for a while and up until just a few months ago I had no idea what the slash method was, and honestly I didn’t have a clue how to actually do it until watching your lesson 1. I’m a visual learner, I have taught myself how to design and manipulate metal with books before I got a new computer (5 or 6 years off line) I consider myself to be a SilverSmith self taught. 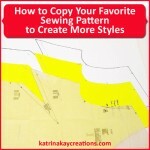 I am so excited to have your help learning how to make my own patterns. Sewing was my first craft and I started young probably around age 10 or 11. I’ve always wanted to make my own designs / clothes but was totally clueless until recently. I’m no where near making up my own designs but now I feel like I at least have a shot at it. So I thank you and look very forward to learning more from you. You’re welcome, Sonya. I’m so glad my tutorial helped you to understand. This is the exact way I learned in school-dealing with fitting came much later. I think it’s so much easier to learn the basics of patternmaking first, then get into the complications of fitting. I’m sure you’ll have no problem learning and making up your own designs. If you can teach yourself to be a SilverSmith, you should have no problem with patternmaking. That’s very impressive! I am so excited to find your site! You are a great teacher, you explain every detail and that is what a beginner needs. I should be working, but I can’t close out your website! Thank you so much!!! Great lesson! I had wondered how the pivot method worked, having looked at Japanese sewing books (Mrs.Stylebook, Lady Boutique). Now I’m off to try it! Thanks for such a clear explanation. Please keep the videos coming, You’re a great teacher. Thank you, Pam. I’m glad the lesson was clear and I hope your pivot method try out goes great! Fantastic first lesson Katrina. I did the exercises and posted pictures on The Sewing Curve FB page (hopefully that was the right one). I love you methods and your presentation. The video wasn’t overly long, yet it contained every piece of pertinent information that I needed to be successful in moving darts in both the Slash and Spread and Pivot methods (first time I’ve ever heard “start with the old, end with the new” but what a good way to remember the pivot method approach). Looking forward to your next tutorial! Thank you, Lojo. And yes, posting on The Sewing Curve page was the right place. I really appreciate it. Your exercises look great! Thank you for doing the work and I’m so glad the tutorials were clear to you. I was trying to make it easy to remember which dart to start with for the pivot method and the only thing that kept coming to my mind was the wedding phrase “something old, something new”. Somehow I got “start with the old, end with the new” out of that. It’s funny how the mind works. Thank you so much. You are an excellent teacher. I have been sewing for about 40 years and use commercial patterns as I have not had the courage or proper knowledge to make my own patterns. Your instructions will also help in altering my commercial patterns. God bless you for sharing your knowledge with us. You’re so welcome, Arlene. I’m so glad this tutorial will help you alter your commercial patterns. I love sharing my knowledge and thank you for your kind words. I thank you for so unselfishly sharing your knowledge. Truly I do. Katrina after I watched this it dawned on me the french dart is exactly what I need in some blouses to make them fit. You’re are so welcome, Elsa. I know how I felt when no one was willing to teach me. Oh, I’m so glad the french dart is a solution to your fitting problem. Such positive feedback everyone is giving me. I really do appreciate it. Kay, thank you so much for this course! I have been sewing for 30+ years and yes, i have altered patterns during that time, however, i will say that i am New to altering them correctly. I have enrolled in a dressmaking program with Stratford Career Institute ( correspondence class) and I am actually studying darts at this time. I was having a little trouble understanding the material and your course just happened show up at the EXACT time that i needed it. Thank you. I am actually using your material in conjunction with my sci lessons. I AM LEARNING!!!!!!!! YAY!!!!! Yes, Cheryl, I’m so happy to hear that! That’s what it’s all about. I’ve been trying to get this out for the last month and kept running into something that needed to be done to make this course as understandable as possible. To read a comment like yours is so encouraging. I’m so glad the timing was right for you and that you’re learning. YAY! Absolutely wonderful! I feel like I have a new sewing friend! You do, Susan. Hello sewing friend! I’m glad you like the first lesson of the series. I’m so happy to give you all what you want and need. Thanks for signing up. This is awesome. Your an exceptional instuctor. 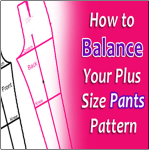 I have been trying to teach my self fitting and patternvdrafting. I have books, watch videos, belong to ASG. I AM OVERWHELMED. You have given me some great advice. Thankyou Katrina. Im going out to buy cardstock today! Yay, Vicki! Yes, get that card stock, it makes things easier. Thank you so much for your kind words, I really appreciate it. I’m glad to be able to help you learn patternmaking, hopefully without the overwhelm. I’m wishing you a positive patternmaking journey! You’re welcome, Vivian. I’m so glad the tutorials were a help to you. These are great tutorials. The miniature sloper lets us “play” with the darts without needing huge sheets of paper – that was genius! Thanks so much. I look forward to learning more – you’re a fantastic teacher! You’re welcome, Shirley. I wanted to make it as easy as I could for you to practice. I like to test new design ideas in miniature for the same reason. I’m glad you’re enjoying the tutorials and thanks so much for the compliment. It means so much to me because I love to teach. Thanks again. I can see myself coming home each evening and anxiously logging on to see what’s next. I haven’t had much tutoring in pattern making so I welcome your instructions. I depend most of the times on the internet for tutorials but I look forward to the step by step hands on instructions. Just want to say thank you for your interest. God bless you! It’s a blessing to be able to teach what I love to do. I ran into some mishaps (bad links, so sorry), but everything worked out in the end. I’m making & editing videos for lesson 2 now, which is the most time consuming of it all. So give me some time, Curtis, lol. Thanks for all your support. Thank you so much for putting your energy into this class. I really appreciate you showing us both the slash and spread and pivot techniques. You are an excellent instructor. I am excited to learn more. You are so welcome, Miriam. I use the slash/spread method more than I use the pivot method. But I think both techniques are good to know, even if you favor one over the other. This series is so worth doing and I’m excited to teach it. I’m a beginner in pattern drafting. I have a drafting program but have not had good results in getting my patterns to fit well. Thank you for the time and effort you are putting into this. You’re welcome, Karen. If you have any questions, let me know.